I have been making these biscuits for at least forty years. 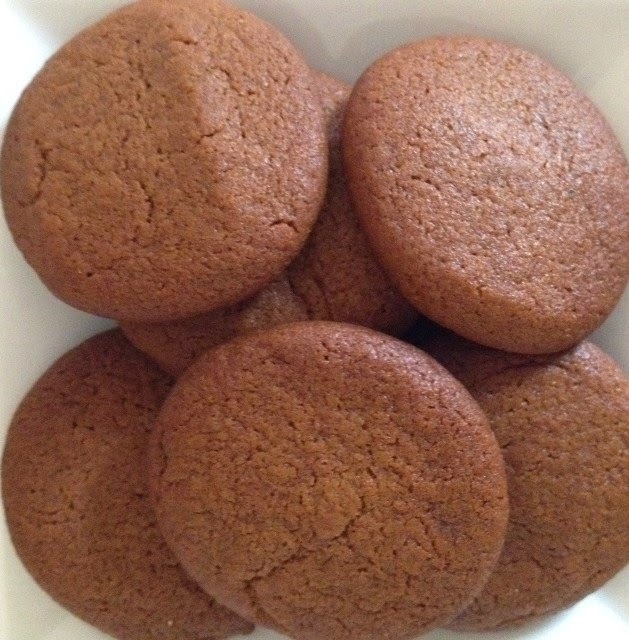 A dear and very old friend of mine describes them as a true old fashioned gingernut - perfect for 'dunking'. They are very hard biscuits and keep very well which makes them an ideal gift. The biscuits can be made in advance, packaged into a cellophane bag, tied with a nice ribbon and I will not have to worry too much about them getting crushed or going soft. I like mine with a little more ginger than listed in the recipe. Heat the oven to 160C (325F). Warm the butter, treacle and sugar in a large saucepan. Roll into small balls. Place on a greased baking sheet, allowing room for the biscuits to spread. Flatten by pressing with your fingers. Bake 15-20 minutes. Cool on tray for a few minutes. Transfer to a cooling rack. Biscuits are very hard when cold. Treacle? is that golden syrup?